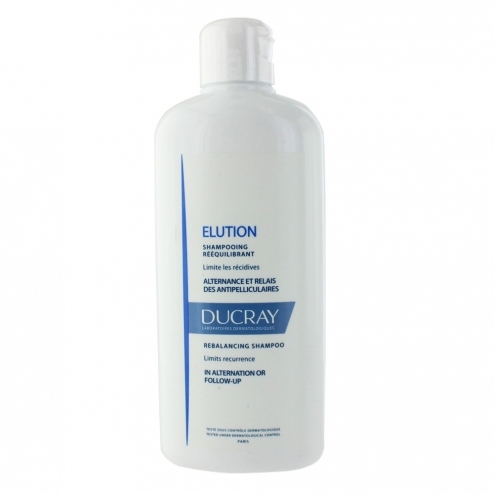 Ducray Elution shampoo gently cleanses the hair and scalp. Ideal as an accompaniment to anti-dandruff treatment or after, it can prevent the recurrence of dandruff. This formula also brings volume and softness to the hair. Use alternately or in combination with dandruff treatment. Apply to wet hair, massage and lather before rinsing thoroughly. INCI formula: Water (Aqua), Sodium Laureth Sulfate, Glycine, Glycerin, Lauryl Betaine, Copolymer Acrylates, Methyl Gluceth-20, Peg-7 Glyceryl Cocoate, Citric Acid, Fragrance (Fragrance), Glycol Palmitate, Glycol Stearate, Hydroxypropyl Guar Hydroxypropyltrimonium Chloride, Panthenol , Pantolactone, Phenoxyethanol, Piroctone Olamine, Silcia, Sodium Chloride, Sodium Hydroxide, Trisodium Ethylenediamine Disuccinate, Zinc Glycinate.